Free transport for Olympic spectators and dedicated road lanes for athletes are among plans being considered to help London win its 2012 Games bid. Ideas to overcome the concerns of the International Olympic Committee (IOC) about the city's transport are being discussed at a conference on Monday. The IOC has said transport was a key hurdle to London's chances. But bid chairman Seb Coe promised "the best planned and operated transport system" in the history of the Olympics. He said: "That is my promise to every athlete who will compete here in London. "And for spectators, transport within London will be free. "Every spectator carrying a valid ticket to any event within London will be able to travel to and from their event for free." The bid team says there will be 240 trains an hour over 10 rail lines into the East London Olympic Park in Stratford. A network of road lanes will be reserved for athletes in cars, buses and coaches. And the Channel Tunnel Rail Link, opening in 2007, will provide a seven-minute shuttle service from St Pancras to Stratford, the team says. It is estimated that a successful Olympic bid would bring an extra 500,000 visitors to London, as well as 16,000 athletes, coaches and staff, 20,000 journalists and 135,000 workers. Organisers say numbers using London transport would swell by 5%, but traditionally traffic reduces by 20% in London during the summer. Transport strategist Paul Willoughby will tell the conference that London is well advanced in its plans. He said: "The sheer volume of people transported around London every day is enormous. "The authorities have the experience and resources to create a special Olympic transport service at the same time as delivering London's non-Olympic transport requirements. "Sydney experienced the same scepticism about transport that London is experiencing now. "However, that scepticism was not the reality for Sydney and, based on the plans I have seen from London's bid team, it won't be the reality for London." The team will put full details of transport plans to cover the 16 days of the Olympic Games and 12 days of the Paralympics to the IOC later this year. 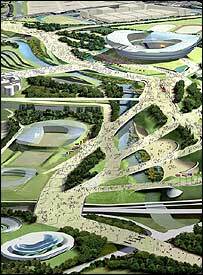 It will decide in July 2005 which of the five shortlisted cities is to host the Games. "Many of these people will be extra visitors to London so will boost the economy"
Most Popular Now | 55,457 pages were read in the last minute.